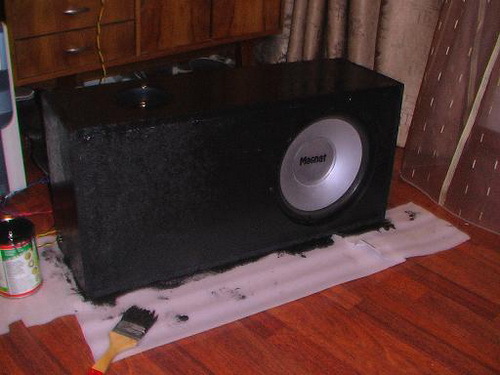 Nice clean sound welcome, not only when writing music, but when listening to it at home, at a party or even in the car. Recently, audiosync indulges us with abundance of grace, which is able to instill a love of quality music. But as we know, costs money. When choosing zvukoizvlechenija equipment necessary to focus on the optimal ratio of price and quality. You can also try to make the box yourself, if you are going to buy some speakers, for example, for the car. Board MDF (22 mm), two speakers. Before sawing MDF, calculate the quantity of material that you will need. This unit will depend on the size of your speakers. To calculate this value use the program JBL Speakershop. To account for all dimensions of the future boxes use during the work program Volume Box Calculator. After marking the sheet of MDF will do the sawing works using a circular saw or jigsaw. Put together 2 the walls of the future boxes to run their compounds: drill small holes, then install the screws. Repeat this procedure for all the remaining walls of the box. The design of our boxes in the section should resemble a square with a diagonal cut, so the top Board needs to do a little bevel. Take a ruler and set it against the two side walls, draw lines of the bevel. With the plane to create the bevel. In a pinch, you can use a conventional plane. After performing a bevel, you need to flip the box on a sheet of MDF and draw lines on which you cut the top cover. Now the same thing with the side walls of the box: put the box on its side and cut note. It remains to connect all parts of the design, linking them with screws and carpenter's glue (for strength). Tick on the box speaker size and cut a circular hole. Can be immediately covered with fabric, and then insert speakers in the box.